As I continue to recover from the car accident, I also continue to face limitations both at work as well as with my training. I’m doing my best to take things one day at a time, especially since some days my back pain is bearable and other days my back hurts quite a lot. I met with a chiropractor Saturday morning. She took a series of X-rays, did a number of tests, and a physical exam. I meet with her again Thursday afternoon to go over a plan for treatment for my back. This past week I did my third set of back-to-back runs as part of my Shamrock training. I did a very easy 3 miles on Saturday (1 min run/1 min walk intervals), followed by 11 miles on Sunday (3:15 min run/0:45 min walk intervals). I was actually a bit worried when I woke up Sunday morning with very significant back pain that Sunday’s run wouldn’t happen. I’m so glad that by mid-afternoon on Sunday that my back pain was much more manageable and that I was not only able to still get my long run in but that I was also able to take advantage of the gorgeous Spring-like weather that we had this weekend. It was quite hard to believe that it was the first weekend of February since the high yesterday was 59 degrees! QOTD: How has the weather been where you live? 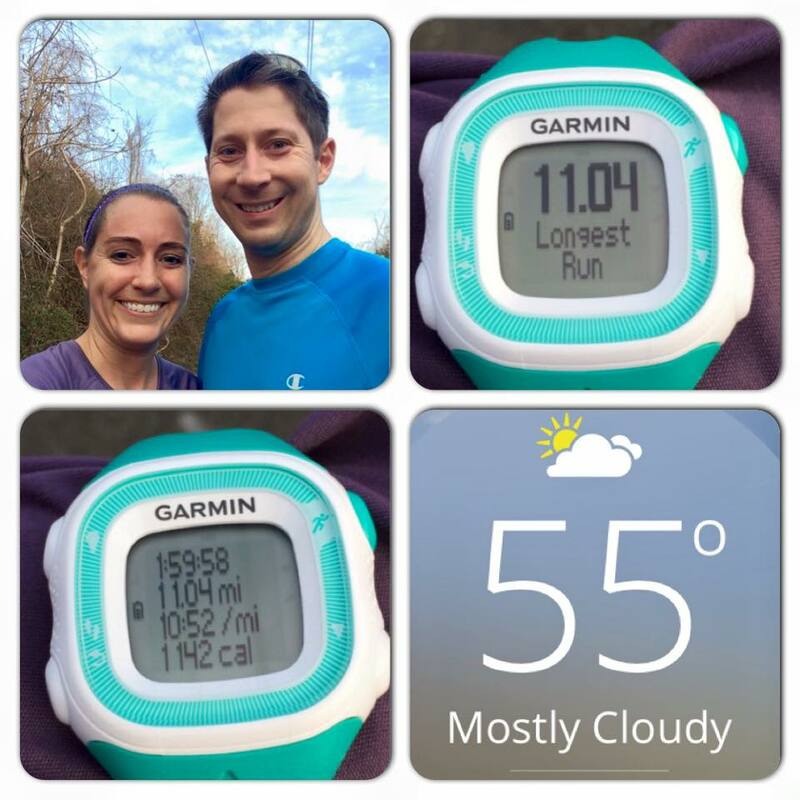 This entry was posted in Shamrock Half Marathon Training, Training and tagged half marathon, half marathon training, half marathon training plan, running, Shamrock Half Marathon, training, training plan, treadmill, walking, weekly recap, yoga. Bookmark the permalink. So glad you were able to enjoy the beautiful day yesterday Kathryn. You have certainly exhibited alot of perseverance as you recover from the car accident. Have a great week! Thanks Pam. Hope you have a great week as well. Glad you were able to enjoy the beautiful weather yesterday! Hope your recovery continues to go well this week. So glad you could get in your long run! And I’m sure the chiropractor will help you heal quickly! Thanks Mindy! I’m hopeful as well. The weather was nice this weekend (when I COULDN’T get out for a run of course!) but it’s getting cold again soon! It got cold here today as well. Where is spring?!?!? What?!!! Thank goodness you are okay!!! So glad that the worst case scenario didn’t happen! Our weather here has consisted of three snowstorms last week dumping 50cm of snow easy, plus ice and freezing rain. Todays its -15, with a windchill of -28. It’s been a week of treadmill runs. Yikes! I don’t blame you for heading straight for the treadmill. I’m so jealous of your 59 degree weather! It was a little warmer in NYC, but I can’t wait for 50s again! Glad you were able to get out there despite the back. I hope it continues to heal up! I love chiros and swear by their therapy for everything! I’ve even gone to mine when I’m fighting off a simple cold. And I won’t torment you with my weather as I haven’t been able to take advantage of it either for running. At least Calypso thoroughly enjoys it, running around like a maniac. Not that that’s different from any other day! It was in the 70s this weekend but Saturday was quite windy. We are supposed to go back down to the 50s, but I want to get outside still. The wind makes it difficult to know how to dress though. I know exactly what you mean. I debated for a good 15 minutes yesterday whether to wear short or long sleeves for my run. I’m glad I opted for the long sleeves. Sounds like you are on track! Hope your back continues to mend and that you will progress as planned with your training. Nice to have the temps warm up too! The warm weather definitely helps! Killer pace for your long run! I was never good at interval pacing for the long ones. I just settled in and went, but I know I could push faster if I paid more attention or integrated intervals. My endurance is definitely not strong enough to just go out and runs for miles and miles and miles. The intervals definitely help me a lot. Thanks Deborah! I’m keeping my fingers crossed! I am absolutely jealous of your weather! Although, the five year old in me is loving having another snow day today! Glad to see you are hitting your groove for Shamrock. I’d love another snow day again. I have lots that really needs to get done around the house. Great job on your long run. I hope your back feels better. I went to the chiropracticor last wk as well but mine was just for an adjustment. Iactually don’t feel any different Hope going back helps you. i’m so happy that you were able to enjoy the wonderful weather yesterday! keep taking care of that back! Gosh, so sorry you are still dealing with pain! You are doing a great job of staying positive though!! It was a beautiful weekend. We took the boys out to play baseball. Such a tease! Yes, definitely a tease, but spring is welcome to come and stay anytime now! I’m glad you were able to get in your long run! The weather here is terrible, we have close to 5 feet of snow and its still coming down. Apparently another storm is heading our way at the end of this week too…so for me, Spring can’t come soon enough! It definitely can’t get here soon enough! Nice job on the run! I hope the chiro can help you get rid of the pain completely. Way to perservere! I hope you feel better soon. My cousin also had a car accident and now her back is having problems. She initially thought there wasn’t a problem but it gets increasingly worse. GEt well soon. Thanks, I really hope I don’t have to live with this back pain long term. It has been crazy cold in Northern NH. I am super thankful for swimming and my bike trainer for keeping me fit through this awful cold weather and while I am injured. It sounds like your training is going well! Good luck with your race! Good luck with your treatment plan. Fingers crossed for you for pain free runs. It is quite warm in Dallas right now. Although I am not crazy about running in the cold I am not ready for the summer heat to start. I’ll take summer heat and humidity any day over being freezing cold. It takes a while to bounce back after an accident. I have kinda been through this (years ago) and I remember it took forever to get to a certain point and then once I got there, the rest just sort of went faster. I think since you’re listening to your Dr’s you’ll be doing great come your half marathon! It’s awesome you’re still able to get so much running in!!! I’ve been trying to push through as much of the pain as I can. Sitting still on the couch just drives me nuts! Our weather has been freakishly strange and unpredictable. You’re doing great with your training. 59 degrees? WOW! We are buried under about 3 feet of recent snow up here in Vermont with sub freezing temps. I’m SO ready for spring! Me too! It was icy and a chilly 19 degrees here this morning. The weather has been crazy here and as I listen to the downpour that just started I am hoping it eases up a bit so I can get a little run in. I am already geared up and ready to run!!! I was just waiting for the sun to come up and rain is coming down by the buckets! Oh no! I hope the rain let up for you.